Do you frequently use Google’s online services such as Gmail, Calendar, and Reader? Do wish there were a way you could view all of these services in one page? 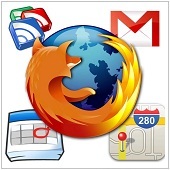 If you use Mozilla Firefox as your browser, you’re in luck. Firefox has a free Addon called “Integrated Gmail” which allows you to view these services from one page. Go to the Mozilla Firefox Addon page and click the “+Add to Firefox” button for Integrated Gmail. Be sure to click on the Install button that shows in the popup confirmation dialog box. After the addon installs, restart your browser and then log in to your Gmail account. Magically, new links to Reader, Calendar, and other Google services will appear in your page.